Florence is filled with culture and art, and considered to be one of the most beautiful cities in Europe. Called the “Cradle of the Renaissance”, the entire historic center has been designated as a UNESCO World Heritage Site. 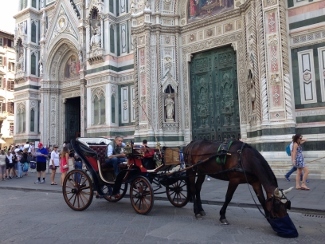 Here is our list of the Top things to do in Florence! Situated in the Northeastern area of Tuscany, Florence is surrounded by hills, and nestled in the basin below next to the Arno River. With 72 museums, glorious churches, and several architectural wonders, visitors often find themselves overwhelmed. We only had one day to explore Florence. 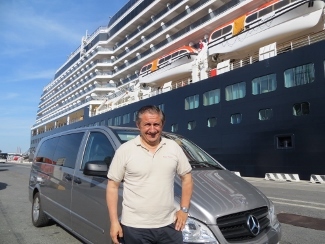 Our Holland America Cruise Ship docked in Livorno, and it was difficult to choose which excursion to take. 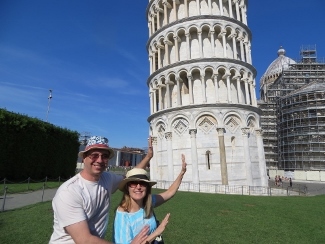 We decided to spend most of our day in Florence, and visit the Leaning Tower of Pisa on the way back to the cruise ship. The best decision we made was to find a private guide who could lead us through the city and learn about its rich history. 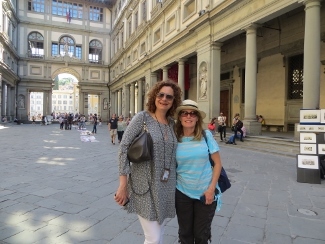 We met Laura Gensini of Sunny Tuscany Tours in the city center and started on our walking tour. 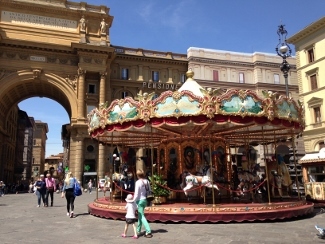 Here are the highlights of many of the sights we saw, and “Top 15 things to do in Florence” plus recommendations below. Guided Walking Tour First off on our top things to do in Florence– Book a Guided Walking Tour of Florence to see the landmarks of the city. See the “Resources” section of this article for details. 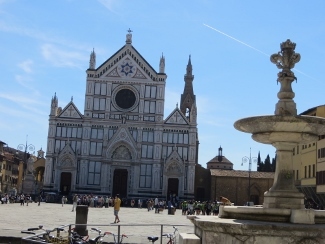 Piazza del Duomo is an ideal place to start a walking tour. 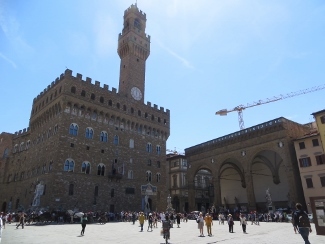 Many shopping streets are connected to this main city square where you find the Santa Maria del Fiore and Baptistery. Santa Maria del Fiore Cathedral is the symbol of Florence, where you can find Brunelleschi’s famous octagonal dome crowning the cathedral. 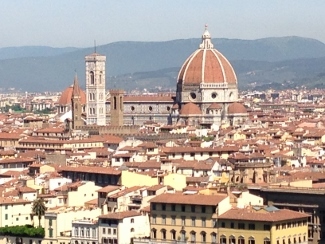 It’s the 4th largest church in Europe, and the tallest building in Florence. Take the stairs up to the Dome, where you’ll get the best views of the city. Baptistery di S. Giovanni is across from the front of the cathedral. 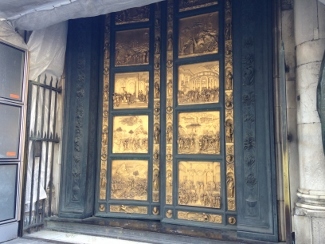 Known as the most ancient building in Florence, and famous for its Bronze east and north door panels with scenes from the life of Christ – it took 25 years for Lorenzo Ghiberti to make these. Michelangelo called them the “Doors of Paradise”. 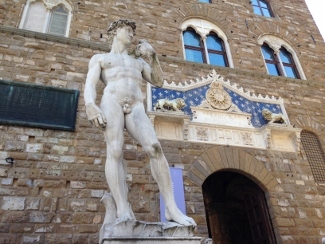 Galleria dell’Accademia is the museum where you can see the original Michelangelo’s David, and collections of sculptures and paintings from Florence Renaissance period. Pitti Palace is the largest of Florentine palaces, where the Medici family, and House of Savoy once lived. Today there are several museums in the palace. Don’t Miss! the Palatine Gallery–its one of our favorites from our top things to do in florence list! 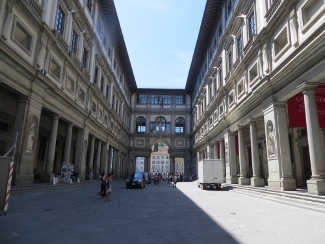 Vasari’s Corridor was built as a covered passageway above ground so the Grand Duke Medici could go from the Pitti Palace to Uffizi safely. Today you can visit the art gallery that is in the corridor, with paintings from the 17th and 18th centuries. Good to note: Advance bookings are required and can be arranged by a private guide. 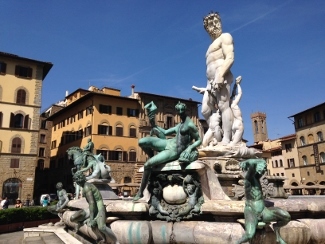 Piazza della Signoria is a large square with several statues including a copy of Michelangelo’s David, Cosimo and more – right in front of Palazzo Vecchio. Galleria Uffizi is a series of buildings that stretch from the Piazza della Signoria to Ponte Vecchio, and house some of the finest paintings in Italy and Europe from the 13th to the 18th centuries, including masterpieces by Botticelli, Michelangelo, and Leonardo da Vinci. 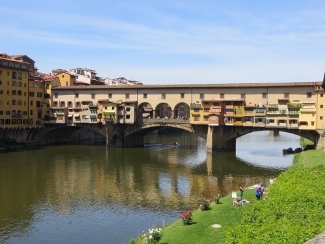 Ponte Vecchio is Florence’s most picturesque bridge. It’s also the oldest and the only bridge that was spared during WWII. There are goldsmith, jewelry, souvenir shops built on top of the bridge. These were formerly used by tanners, butchers, and fishmongers. Church of Sante Croce was built between the 12th and 14th century, this church has beautiful frescoes and the tombs of famous Florentines. Mercato San Lorenzo is Italy’s largest open-air market surrounding Medici’s Church of San Lorenzo. 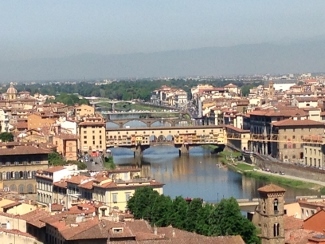 Best View of Florence is across the Arno River from the city center. Go towards Piazza G. Poggi, then go up the stairs towards Piazzale Michelangelo, east of Fort Belvedere. 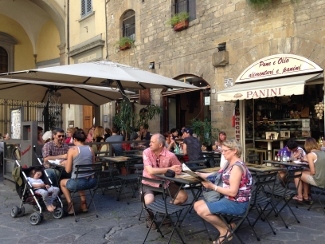 You’ll see a terrace with an overlook where you can have panoramic views of Florence. Don’t Miss! Go here for sunsets. A MUST when you are in Florence! 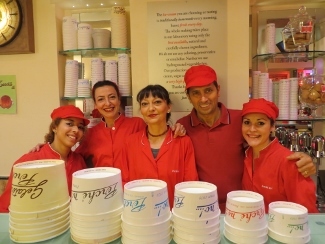 Order homemade gelato at Florence’s best gelateria at Perche no! Shop! 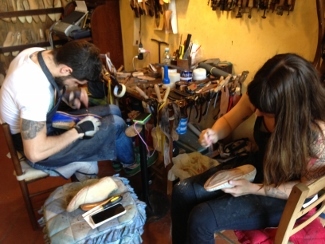 Our guide Laura took us to a neighborhood in Florence near Piazza Spirito, where several craftsmen still practice their trade – printmaking, handmade paper, leatherware, custom made shoes, textiles and jewelers. 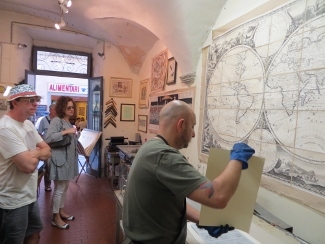 We visited La Casa della Stampa, Roberto Ugolini, Casini, and L. Vettori and were impressed with the craftsmanship of these locally made goods. And that’s the end of our top things to do in Florence! TUSCANY COUNTRYSIDE: There are several day trips you can take from Florence including these enchanting medieval towns – Lucca, Siena, and San Gimignano. We visited Pisa on our day trip to Florence and Pisa before returning to our Holland America Cruise Ship in Livorno. PISA – Leaning Tower of Pisa: The famous bell tower of the Pisa Cathedral is a “must” see! Built in 1350 A.D. with a height of 180 ft. that has since tower gone sideways. Due to a shallow foundation and sandy silt soil, the tower started to lean and now tilts, but today it stands with the support of counterweights and anchors. 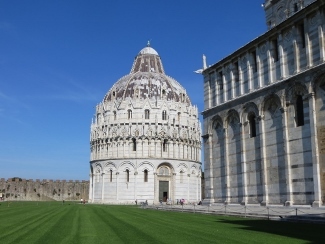 If you have time, walk the Field of Miracles, Piazza dei Miracoli, surrounding the tower to see the 900 year old marble Cathedral and Baptistry. 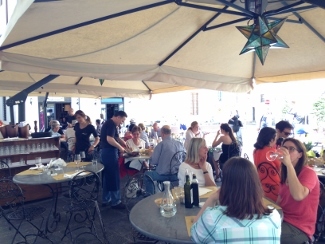 Trattoria 4 Leoni is an authentic Italian trattoria near the Ponte Vecchio Bridge. While we dined on Florentine steak, mozzarella salad caprese, we were visited by an accordion player. La Dolce Vita! Perche no! for Gelato! Order homemade gelato at Florence’s best gelateria at Perche no! Global Adventuress would like to say GRAZIE to the Tourism Office and Sunny Tuscany for the insightful tour of this beautiful city! 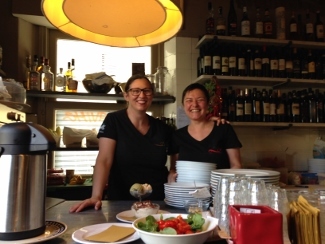 Also, we’d like to thank Trattoria 4 Leoni for the delicious hosted lunch, and Perche no! for the divine gelatos. Sunny Tuscany We highly recommend Laura Gensini and Ricardo Teresi as guides. Laura was our private guide for our day tour of Florence, and she knew all the best places to visit, and has a network of connections that can get you into the “back door” of Florence from local craftsmen to private tours. 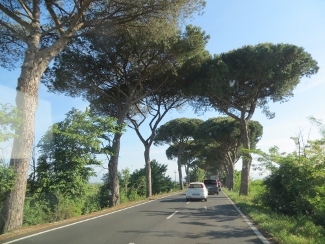 Sunny Tuscany creates and offers private tours in Tuscany with a variety of excursions in Florence, Pisa, Lucca, Siena and San Gimignano. Whether you want to explore the Tuscan countryside, take a cooking class, visit historical villages, or go wine tasting, they will arrange everything for you. 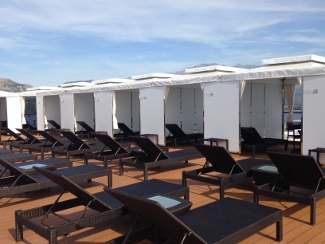 Holland America Cruise Line We went on the Holland America Mediterranean Cruise and stopped at the Port of Livorno, Italy, and had an amazing day in Pisa and Firenze (Florence)! The one you have is not working anymore. I’m going in October and am delighted to see these recommendations. I plan to return to the Uffizi and linger there. I’d also suggest the ferragamo museum! Grazie!